My name is Michael Borsk and I am a third year history major studying at the University of Toronto. I'm currently working at Awenda Provincial Park on the shores of Georgian Bay as the Natural Heritage Education Department's Cultural Heritage Specialist. 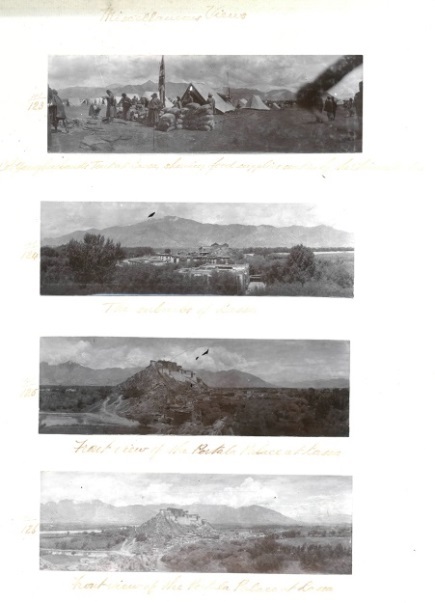 In the course of our research, I came across an early 19th century report from a Doctor Bawtree, who excavated some Huron ossuaries around Awenda. In the foot note of his report on his findings, he notes that these specimens are destined for the Fort Pitt Museum. Among them are a collection of pipe and pottery fragments, a conch shell, and rusted sword. In attempting to locate these artefacts, I read an article from the 1985, No. 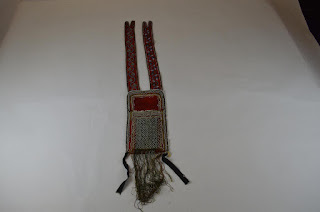 17 Newsletter by the Museum Ethnographers Group addressing the location for these specimens. While they had not yet been found in 1985, I am wondering if they resurfaced in the past 30 years and if any of your members may know their whereabouts. 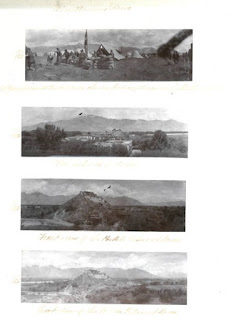 We currently have Dr. Bawtree's watercolour sketches of his findings, but we would like to get images of the artefacts themselves to add to the Park's archives. There is no doubt that the public appetite for science is growing. The interface between science and culture continues to shift and is a constant point of excitement, interest and debate. Arguably science cannot be presented in isolation but as an integral part of our culture, intersecting with the arts and humanities, with museums providing ideal spaces to demonstrate and communicate this. The conference will introduce delegates to the current science research landscape and will explore the intersection of science with arts and culture in a museum setting. Keynotes and panel discussions will address the challenge of combining these themes and linking collections in ways that inspire our visitors. Sessions will bring practitioners in the sciences and social sciences together with museums professionals and artists to talk about science engagement and reinvigorating science collections in museums. This includes lunch, tea and coffee on both days as well as the optional museum tours on the second day. The evening drinks party is being supported by Durham University. A reduced rate of £45.00 is available for students (limited to 20 places). City centre university accommodation is available within Durham Castle (University College) and neighbouring Hatfield College at a special conference rate. This can be booked online at the time of booking the conference. A range of single, double and twin accommodation is available, starting at £54.16 per person per night including a full English breakfast. Alternatively a range of hotels, guesthouses and B&B accommodation is available in Durham city centre. Blackfoot territory includes northern Montana and central and southern Alberta near the Rocky Mountains in Canada. I’d be very grateful to learn of any examples in UK collections for future study. Please email me with any examples. Laura Peers (Pitt Rivers Museum). From March to August 2014 National Museums Scotland led a project funded by the British Academy/Leverhulme called Military Encounters – Reassessing military collecting in North America and Tibet. 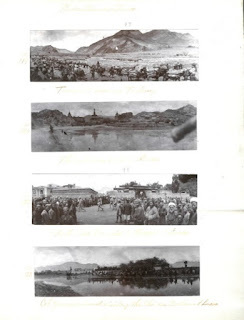 The aim of this project was to bring together material culture specialists from the fields of anthropology and military history to survey and assess the interpretive potential of ethnographic material in military collections with reference to two selected British campaigns: the Seven Years’ War in North America (1754-63), later expanded to include 19th century material, and the Younghusband Mission to Tibet (1903-04). The survey included objects, photographs and archival holdings. 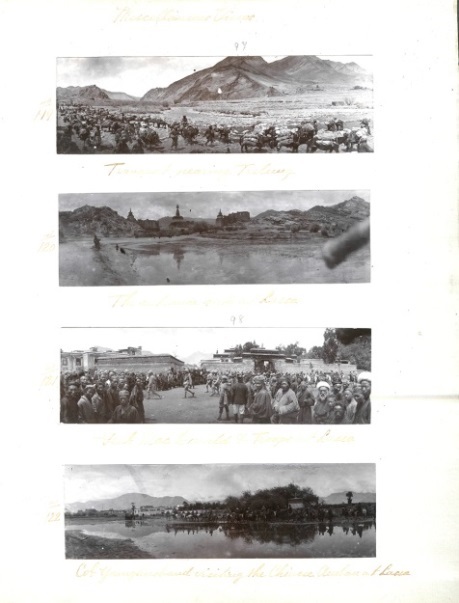 In addition, most regiment’s have their own journal which can contain useful information about the history their collections, acquisitions and former displays. 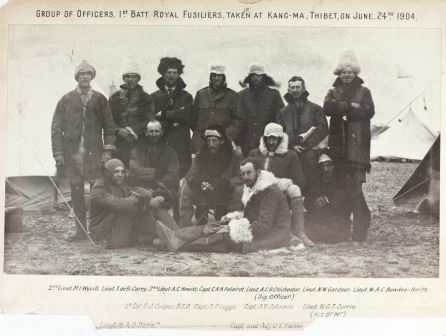 The Royal Engineers Museum, Library and Archive in Kent have a number of items of indigenous North American clothing from the 1840s and a large photography collection. 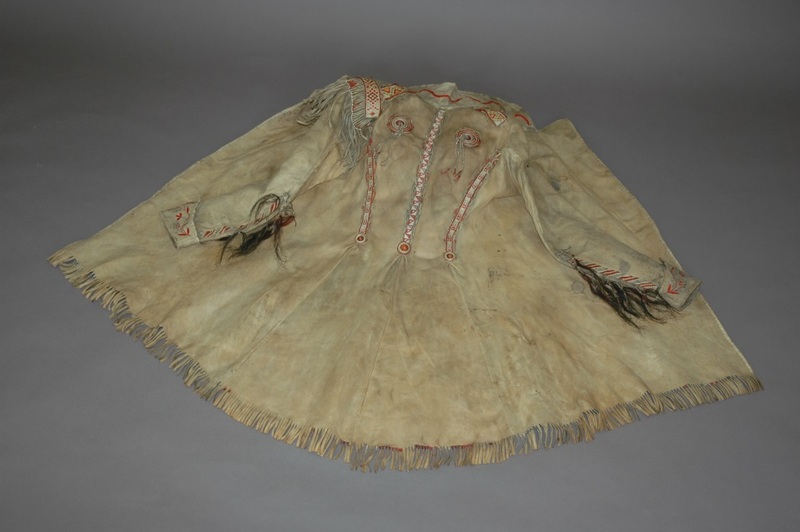 Highlights are a coat, bag, gloves and leggings that were presented to the museum by Captain Moody who was stationed at Fort Garry on the Canadian/United States border. This coat and satchel are typical of items that combine materials and designs of both indigenous North American and European origin. The Métis coats has features commonly found in European military uniform, a straight collar, quilled epaulets, with floral decoration on the lapels and cuffs, and elaborate quillwork ornament on the back. 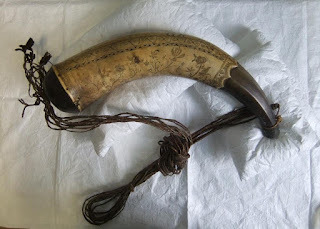 The Royal Green Jackets (Rifles) Museum in Winchester has a significant amount of non-European material on display from various campaigns, but from North America they have a powder horn dated 1757 from Fort Edward, New York which belonged to Lieutenant John Longsdon of 3rd Battalion 60th Royal Americans. The carving of this horn is similar to the one in the military collection here at National Museums Scotland that once belonged to a soldier in the 42nd (Royal Highland) Regiment of Foot, also from New York and dated 1758. 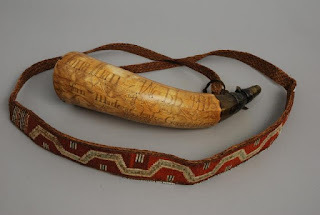 Maps, dates, floral patterns, rhymes and names are carved onto the surface of the horn, and we believe this particular style to be the work of an amateur. The most significant thing about these powder horns is the indigenous origin of the straps, which come in different forms. One is quilled and is of the form often described as a prisoner tie, though we are researching this more fully. The other is a burden strap or ‘tumpline’ which military records of the mid 1800s show were issued to light infantry men. 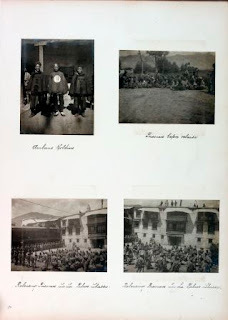 The Fusilier Museum at the Tower of London has a number of photograph albums and diaries which provide a fascinating insight into the Younghusband Mission to Tibet (1903-04) from both a regimental and personal perspective. This compliments a collection of around 40 objects brought back from the campaign. Only seven men from the 1st Battalion Royal Irish Rifles served in the Mission as a machine gun detachment under the command of Lieutenant J. C. Bowen-Colthurst. Despite this, the Royal Ulster Rifles Museum in Belfast has a large album of 450 photographs with a handwritten index, as well as Bowen-Colthurst’s personal scrapbooks and photographs and a bone Cham costume ornament brought back by Colour-Sergeant J. Lyle. Photographs, scrapbooks and diaries proved to be a common strength of the Younghusband material across the collections surveyed, and significant overlaps were noted. 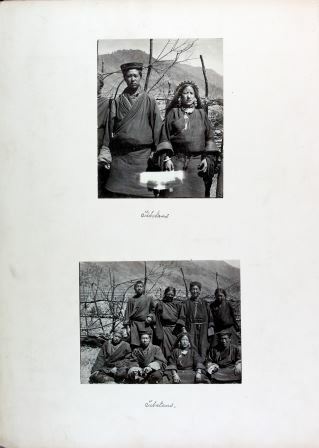 DrClare Harris, Professor of Visual Anthropology and Curator for Asian Collections at the Pitt Rivers Museum has already been consulted and with her expertise we want to look further into the mixture of personal, official and commercial prints in these albums, and tease out the particularities of military photography. All the project’s findings have been collated in a catalogue and for further information please contact any of the project team, details below. We would also be happy to receive any information you may have about regimental collections in your area as we are planning on extending this research to look at material brought back from other locations and campaigns. Assistant Curator, National Museums Scotland.